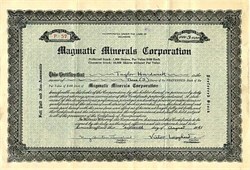 Beautifully engraved certificate from the Magmatic Minerals Corporation issued in 1941. This historic document was printed by Broun-Green and has an ornate border around it with a vignette of company's name. This item is hand signed by the Company's President ( Victor Lougheed ) and Secretary ( Mary Hunter Lougheed ) and is over 63 years old. The certificate was issued to Taylor Hardwick. Victor was an automotive engineer who was interested in flight. Shortly after the Wright brothers flew, he wrote two books on airplanes. He worked with California inventor John Montgomery on airplane experiments. Victor's younger brothers, Allan and Malcolm Loughead, followed those interests. Allan became an automobile mechanic and then learned to fly. Working part time, Allan and Malcolm Loughead produced a seaplane which was the beginning to the Lockheed Aircraft Company. They named the company after themselves and, in 1926, legally changed their own and their company's name from the old Scottish spelling of Loughead into Lockheed. In 1910, Victor Lougheed, Horace B. Wild, and James E. Plew constructed and flew powered a Montgomery-type tandem wing flyer. In 1912, Victor Lougheed wrote about the new airplanes. He was the elder brother of two men who later created the Lockheed Company. His title was Airplane Designing for Amateurs. Lougheed saw that anything as new as flight had to be created by people without the blessing of a profession. Victor Lougheed also designed the Taft-Pierce-Loughead V-8. Lougheed designed and built the engine in 1911 and the Taft-Pierce Manufacturing Company of Woonsocket, Rhode Island, manufactured it. It was made almost entirely of Krupp chrome nickel steel at a cost of $15,000, the crankcase and cylinders being turned from solid billets weighing approximately 2,000.